pantsguys Productions and Griffin Independent present ON THE SHORE OF THE WIDE WORLD by Simon Stephens at the Stables SBW Theatre, Kings Cross. ON THE SHORE OF THE WIDE WORLD by Simon Stephens won the Olivier Award for Best play in 2005. Mr Stephens, also, won The Olivier Award for his adaptation of THE CURIOUS INCIDENT OF THE DOG, from the novel of the same name, by Mark Haddon, in 2013. pantsguys Productions has previously presented Mr Stephens' PUNK ROCK, which was also directed by Anthony Skuse - and this production is a return to form for pantsguys after their, unhappy, for me, recent production of SWEET NOTHINGS, late last year. Mr Stephens grew up in Stockport which is a suburb 11 kilometres from the centre of Greater Manchester, North West England. Several of his plays: PORT (2002), ON THE SHORE OF THE WIDE WORLD (2005), MOTORTOWN (2006), HARPER REGAN (2007), PUNK ROCK (2009), are all set in that area of his origin, Stockport. And what has been accumulating by focusing on individuals and their families in this particular community, set in the framework of the United Kingdom, and perhaps, because of their appeal and success around the world (here, in Sydney, for example) is a construction of a series of plays, whose ramifications are relevant to the universe of the brotherhood of humanity - much like say THE ORPHANS CYCLE of Horton Foote - a three part, nine play look at the people of a town called Harrison in Texas, or the August Wilson, ten play cycle known as THE PITTSBURGH CYCLE, or say, Louis Nowra's THE BOYCE TRILOGY, set in Sydney. They provide a storytelling experience that although set in a tiny 'city' in a foreign country is as pertinent to there as it is here. "How many stars are in the universe? ", Peter Holmes asks his wife, Alice, in the play. "200 billion," he estimates. "How many people are there on the earth? ", I asked myself, at that moment in the play. "7 billion." says Google. And like those stars in the universe, each of those 7 billion people are as unique as each of those stars in the 'heavens'. Each are as unique, each are on their own trajectory, and each is as independent and interdependent to each other as those stars that hang in the gravities of the evolving universe. ON THE SHORE OF THE WIDE WORLD has that breadth of vision within the context of the three generations of the Holmes family, of this play, set in Stockport - all are connected and yet all are independent. All of them are known to each other, but all of them have 'vastnesses' that are unknown to each other. We never know, completely any person, and perhaps, least of all ourselves. This is the aching revelation of this wonderful play. That all of us have secrets and most are not known, and that there are consequences of cause and effect of this great truth, is partly, mostly, what this play is about. It is a pleasantly comforting experience, perhaps, because it is proffered in the context of what is a recognisable world of an ordinary family. A family, like ours. "All happy families are happy alike; each unhappy family is unhappy in its own way", says Leo Tolstoy in the first paragraph of his novel ANNA KARENINA. …And when I feel, fair creature of an hour! Charlie Holmes (Paul Bertram) and Ellen Holmes (Kate Fitzpatrick) are the grandparents; Peter Holmes (Huw Higginson) and Alice Holmes (Amanda Stephens-Lee) are the middle generation of parents; Alex Holmes (Graeme McRae) and Christopher Holmes (Alex Beauman) are the younger. This younger generation of boys, both, provide a bonding between all, but will also, each in his own way, provide the catalyst for this family to have cause to SEE each other properly. Therein lies the drama of this play. In his program notes Mr Skuse quotes from Robert Hughes in his book A JERK ON ONE END: REFLECTIONS OF A MEDIOCRE FISHERMAN (1999): " ... it is easy to look, but learning to see is a more gradual business ..." When one looks at one's loved ones: "What do you see?" and then, "What can you see?" is a reflection that Mr Stephens and this company ask us to consider in our own relations. All the company of actors have the magic ingredient of individual clarity and skill and the great gift (or accident), in the performing arts, of a simpatico ensemble. All are a part, of this production, worth nurturing, and all the parts make a whole, worth cherishing.That this hallmark - always striven for by all who embark to apply their craft to the art of performance - is a rarity in the theatre, and yet a common element of most of Mr Skuse's work, is worth taking note of, and underlining. Amanda Stephens-Lee, Graeme McRae, Alex Beauman, Lily Newbury-Freeman, Jacob Warner, Alistair Wallace and Emma Palmer are part of the acting ensemble. But it is, particularly, the beautifully, etched portrait of extraordinary vulnerability and painful courage that Huw Higgingson brings to the father, Peter Holmes, in the middle generation of this family saga, this very ordinary family's saga, that radiates basic human frailties reflecting us all, that provides the keel of the journey through this production. The understated growing awareness of his predicaments and the painful, at last, verbal exposition of his longings make for a soul holding set of great moments in the theatre. Not to be missed by those who love good acting. And to further add to the performing interests of this production, and a powerful reason to get to the pantsguys-Griffin Independent production, up at the Stables SBW Theatre, is to welcome and applaud two Australian actors of an older generation in this production: Paul Bertram and Kate Fitzpatrick. I have often speculated about the consistency of good work that we regularly see from some great artists and often marvel at, say people such as Ian McKellen, Frank Langella, or Judi Dench and Meryl Streep etc and count some of their quality of consistency to the fact that they have had lots of practice opportunities. Here, in Australia, those opportunities are not necessarily available, so it is with extra wonder that one watches Mr Bertram and Ms Fitzpatrick, who I have not seen at all regularly in the theatre, if at all, for many, many years, and appreciate such consummate skills, judgement and 'beauty' exampled in their craft in this production. Mr Bertram inhabits a character not altogether a pleasant human being, and is able to draw from us, ultimately, a compassionate understanding, if not complete forgiveness, for his Charlie Holmes, with insightful and fearless, unerring delicacy - I shall not be able to forget his great long speech, towards the end of the play, and never, for certain, the pathetic image of his semi-naked body, slumped in a kind of private anguish on a bench; whilst Ms Fitzpatrick gives a centred, understated and ultimately, moving creation of a long suffering and misunderstood woman, attempting to do the right thing for all - and, usually, least right for herself, as Ellen Holmes. The quiet tears streaking her makeup is affecting, and, not least, because there was no attempt to demonstrate them - the sensibility and sensitivity is immaculate in its choices from Ms Fitzpatrick. It is interesting to see Ms Fitzpatrick appear without nervousness, that I could see, on the night I attended, for the Stables theatre is a very vulnerable space to play in, and some time has passed since she has performed - although I did see her give a monologue at the Seymour Centre in SINGLED OUT, last October and was impressed. Having the opportunity to speak to her after the performance, Ms Fitzpatrick talked of the thrill and excitement, of being back on stage again, a place that she felt, almost with relief, was a welcome place to find herself on again. Let us hope that more of both these two artists is seen in the near future, for their skill and passion is a marvel to behold in the context of the Australian industry cruelties. In any other country, perhaps, they would be just as famously consistent and brilliant as the above mentioned "stars" and, just as often, seen. Think the example of Jackie Weaver and her recent international success - it isn't just luck, you know (!) and when was she last on the major stages in Sydney? Gez Xavier Mansfield has designed both the Set and Costumes for this production; Sara Swersky the complex lighting plot, whilst Marty Jamieson has made a quiet and unobtrusive Sound Design. There should be note of the excellent work by Linda Nicholls-Gidley with the dialect coaching (although, one or two of the actors appeared to be too accurate for some of our Australian ears to catch all). The Direction of each of the actors in this large ensemble of 10 actors (for Sydney theatre) and the stylistic management of the characters as witness to the events of the play, has been thoughtfully and excellently prepared by Mr Skuse. 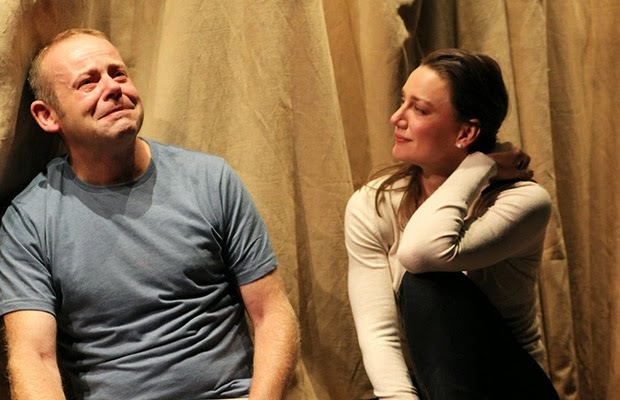 ON THE SHORE OF THE WIDE WORLD by Simon Stephens is an auspicious beginning to the Sydney theatre season of 2014, and considering the dearth of interesting theatre work available, in this January Sydney Festival, is a must see. Couldn't agree with you more Kevin! What a performance from Huw Higginson - outstanding. Thought the play itself (maybe the production) could have done with a few lighter moments, just to add contrast. Definitely better than either of the shows at the major theatre companies.